In Stock, Free 1 Pack Shelf added to cart! Free 1 pack of Shelves! The 04212 extension kit is not compatible with this shed. 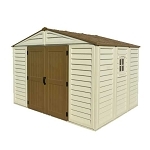 This Brand New 10 x 10 ft Duramax Woodbridge Shed is the perfect place to store all your garden needs. Alternatively, you can use it as extra storage space for household items. 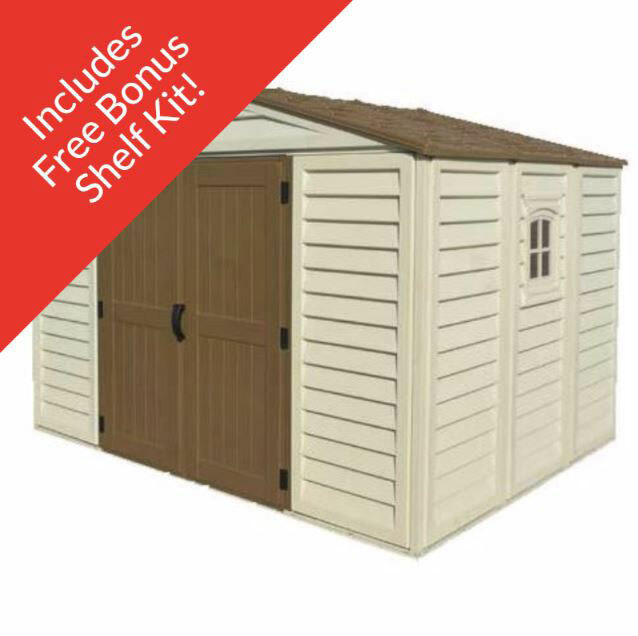 Increase your storage space by ordering this shed today! The 10' Wide Woodbridge Plus is our plus signature line that gives you the greatest solution for all your storage needs. As long as you have the room, this is the ideal storage for you. 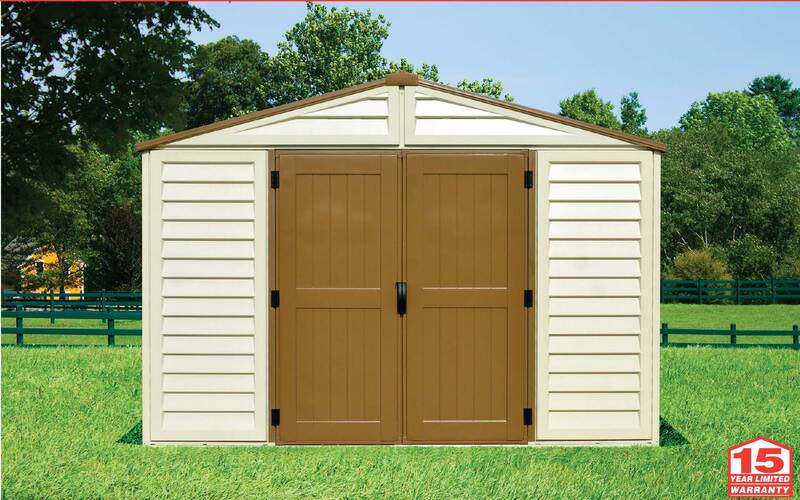 With so many cubic feet, this shed provides a wonderful addition to any yard. The building is packaged in a heavy duty cardboard box with plastic shrink wrapped on a wood pallet. The packaging includes all components, hardware and an illustrated step-by-step instruction book.Ships via a common carrier, lift gate required and included on residential delivery. If anything is damaged or missing, let us know, and we will get it replaced. The assembly process is simple, clean, safe and can be completed in four to five hours with two people. 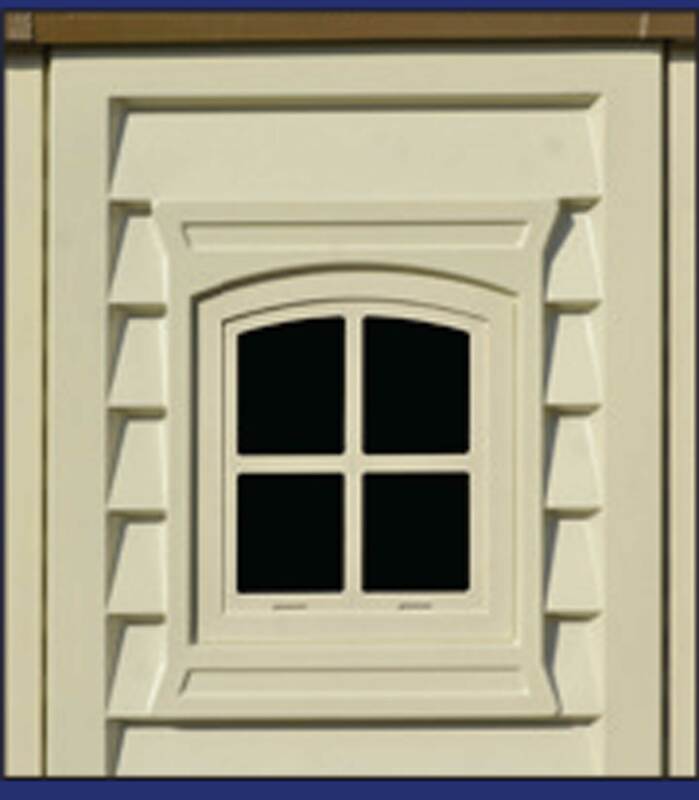 All of the parts are pre-cut, drilled and numbered for easy assembly. All you need is a level surface of wood, or concrete, to fit the desired building. Additionally you will need a power drill, hammer, measuring tape, pliers and a ladder. This model replaced the older discontinued 00581 and 00584 w/foundation. There is no longer an option to purchase the Woodbridge 10.5 x 13 without a foundation - this model 40234 does include the foundation kit. The storage building is a quality building. The directions leave something to be desired. All instructions are photo's only. There is very little verbal instructions. I have built many things and work construction. I have not built with the photo's only before. If there was written directions it would make assembly easier. Q: Is this building easily broken into? Q: THE DURAMAX 40234 WOODBRIDGE PLUS 10.5 X 13 SHED WITH FOUNDATION KIT. DOES IT INCLUDE THE FLOOR? IF NOT, CAN I PURCHASE THE FLOOR KIT FROM DURAMAX? A: Give us a call for discount price options. 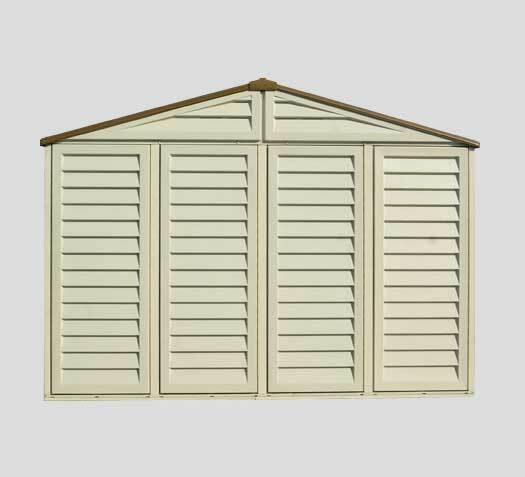 Q: Do you have a manual for this shed model number 40234? A: Yes, we sure do. Simply click on the instructions tab in the bottom right area. Feel free to contact us with any other questions. Q: What is the overall height on the Duramax 10.5 x 13 and the 10.5 x 10.5 Shed? Q: What's the shipping weight? A: The shipping weight is 310 pounds. Q: How wide is the door opening ? Q: 10.5 in. "wide" x 13 ft. "deep"? A: 127.9" Wide x 97.2" Deep x 91.8" High to be exact. Feel free to contact us with any other questions. 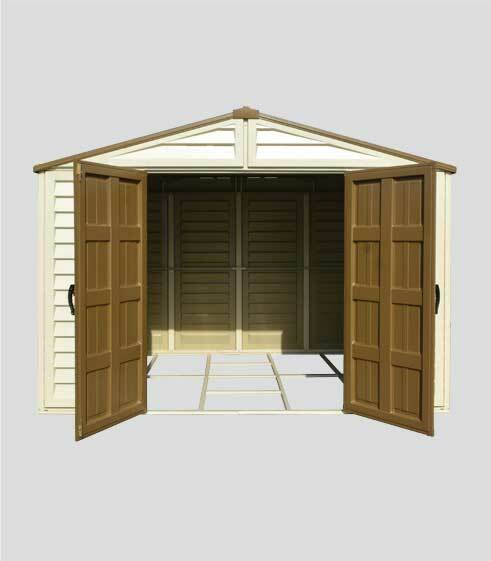 Q: Does this Woodbridge plus shed have extensions as options? How much? Also is window included? Any other accessories available? Since not currently in stock, when might you have it? Q: Will the summertime heat bother them as far as shrinking them Or making them brittle ? Also what's the warranty on those ? 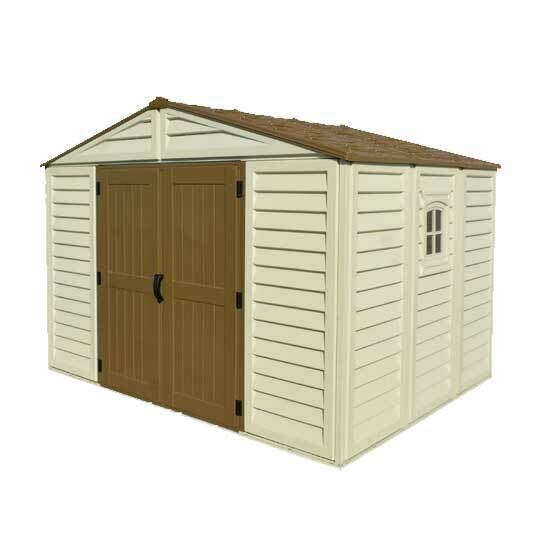 A: This shed is designed to withstand the Arizona sun and the Alaska winters. It holds up just fine in all temperatures. The warranty is 15 years and it covers any manufacturing defects. Feel free to contact us with any other questions. This particular shed ships in 2 boxes on a pallet. Sometimes the paperwork includes the pallet as its own separate piece. When you sign for the shipment it may include the pallet as a separate line item. 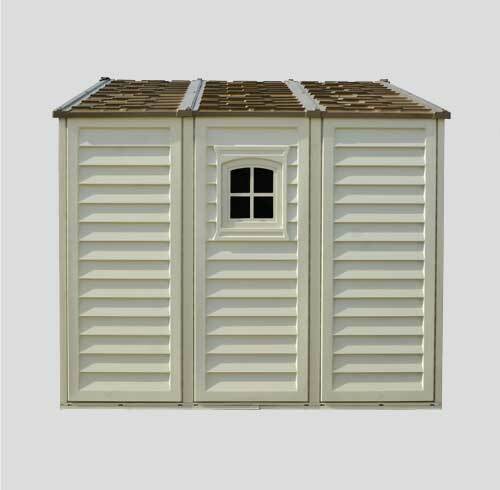 Fast Shipping: Orders for the 40234 Woodbridge 10' Storage Shed with Floor and Foundation generally leave the warehouse the next business day. They are usually delivered within 2-8 days with standard shipping. Call for more exact estimates. Delivery Details: This product ships directly from the factory in Montebello, California. Delivery of this product is via a curbside delivery through an LTL carrier (too big for UPS and FedEx). The customer must be present to sign for the order. The freight carrier is instructed to contact you prior to delivery to set up a delivery appointment. Local Pickup Option: This item is available for local pickup in Montebello, CA. If you are interested in picking it up locally contact our customer service for a special pickup quote at 866-308-5484. * Before assembly please do a full inventory opening each box to ensure everything is intact. If anything is damaged, defective, or missing please report it immediately and do not assemble until all parts are intact. Returning these large ticket items can be expensive as they are too big for UPS and ship through a motor freight carrier. Please note that if anything is damaged or defective we replace it free of charge avoiding any return restocking fee. If anything is damage, defective, or missing it must be reported within 14 days of receipt. The assembly is simple, clean, safe and can be completed in four to five hours with two people. All parts are pre-cut, drilled and numbered for ease of assembly. All you need to provide is a level surface of either wood, or concrete, the size of the desired building. In addition you will need a power drill, hammer, measuring tape, pliers and a ladder. Dimensions: 76" x 43" x 9"